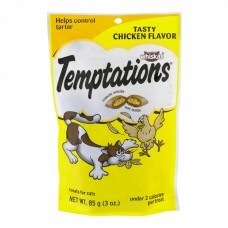 Whiskas® Temptations® Tasty Chicken Flavor Treats for Cats. Helps control tartar. Crunchy outside. Soft inside. Under 2 calories per treat. Stay fresh pouch! Tasty chicken flavor. To cross or not to cross the road, that is the question. And a very simple one it is, for one of the feline persuasion, when a delicious, bird-brained hen is the prey on the other side. Oh, chicken, I will taste victory! You can count on it. Soon as you gimme some Temptations® Treats! For more feline fun, visit temptationstreats.com. 100% nutritionally complete & balanced for growth and maintenance. Tartar control under 2 calories per treat. Just shake the bag and they'll come running. Whiskas® Temptations® treats for cats tasty chicken flavor is formulated to meet the nutritional levels established by the AAFCO Cat Food Nutrient Profiles for growth and maintenance. The world's leading authority on pet care and nutrition. Waltham. Guaranteed - Analysis. Crude protein - min. 30.0%. Crude fat - min - 17.0%. Crude fiber - max 4.5%. Moisture - max.11.0%. Calorie Content: (calculated) 4050 kcal me/kg. Questions or comments? 1-800-525-5273. ®/™ Trademarks © Mars, Incorporated. Temptations® cat is a ® trademark. Feeding instructions: feed up to 15 treats per 10 lb. of cat daily as a treat or snack. If fed as a main meal, 1/4 cup of Temptations® Treats for Cats can replace 1/4 cup of Whiskas® Meaty Selections® food for cats or Whiskas® kitten food. Provide fresh drinking water at all times.